The hospital gown carries a long history of bare bottoms trailing behind it, but one group from the College of Textiles of North Carolina State University is looking to change the future of the hospital gown. In a report this morning by the WSJ, a small team of students and faculty from the College of Textiles are utilizing a $236,110 grant to revolutionize the ill fitting and over-exposing hospital gown into a more comfortable, and fashionable alternative to it’s predecessor. According to the article, the hospital gown can be traced back as far as the 1800’s where it was no more than a nightshirt with a slit up the back. Since the 1920’s, only minor variations have managed to make their way to hospital rooms. Speaking from experience—two children and a 4 day stint last summer after having my jaw broken—I feel confident in saying there must be a better way to preserve ones pride, while remaining accessible to doctors and hospital staff. The only thing worse than wearing the embarrassing, body bearing sheet, is the paper bolero that you are provided prior to a visit to the OB/Gyn. But did you know that patient gowns are a $76 million dollar business, with each gown costing as little as $2-3 each? I’m sure that will come as no surprise to anyone who has worn one of these scanty gowns, while clutching each side of the fabric closed to prevent sharing a little too much with their neighbor in the hospital room. The North Carolina State University team has been working for the past 2 1/2 years to find a better model. “ ‘We thought that it would be a much easier problem to tackle,’ says Prof. Traci Lamar who has been leading the effort.” The team has experimented with different sleeve styles, pockets and fasteners for their prototypes and showcased their ideas during an in-house “fashion show”. It was interesting to learn in the article, that Hackensack University Medical Center in Hackensack N.J., hired popular fashion designer Nicole Miller, to re-invent their patient gowns. How I would have preferred to wear something like that last summer, vs. the pale blue string-tied sheet that I suffered in. As you might assume, the designer hospital gown is double the price of it’s conventional counterpart—hence the lack of orders by other hospitals. Bummer. So we shall have to wait and see what sort of progress the NC State University will make; who are also responsible for the marketing and production of the garments. 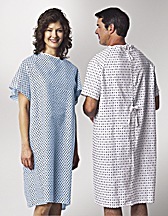 Do you have any funny hospital gown stories? Leave a comment and let us know. To read more about this story, go to WSJ.com.